The world’s best trend map. Ever. Nowandnext.com and Future Exploration Network have collaborated in producing a map of major trends for 2007 and beyond, across ten segments: society & culture, government & politics, work & business, media & communications, science & technology, food & drink, medicine & well-being, financial services, retail & leisure, and transport & automotive. Inspired by the subway map for a well-known city, the map shows some of the major trends in each of these segments, as well as the key intersections between the trends. The other nice touch is how it’s been made open source. 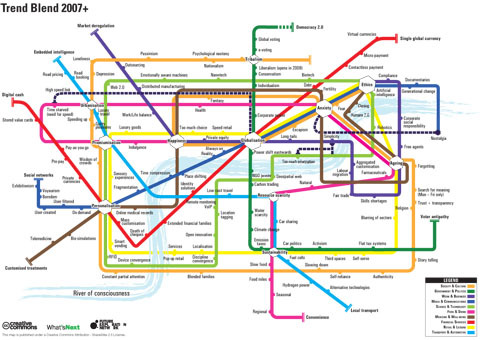 Being a great fan of Edward Tufte, and especially ‘The Visual Display of Quantitative Information’, it’s great to see the classic underground map being employed to help untangle the impossible complexity of overlapping trends. The beauty of this map, or one like it, is that once you know your way around it, you can use it to present, over and over again. Simply thread your narrative with reference to the lines and ‘stations’ on the map. Entry filed under: trends, visualization. This is one of the coolest things I’ve seen for a long time. The whole concept of visualising data is very interesting. Thanks for posting. The visualisation of data is catching on. Currently, the group which is known for leading the way in visualising for business is XPLANE – http://xplane.com/. They call themselves a visual thinking company and are helping businesses convey complicated messages and strategies via effective design. Anyone interested in learning how the XPLANE process works should check out their free online visual thinking school – http://www.squidoo.com/communicationnation/. Taking a closer look at the map, I found one trend missing – social entrepreneurship. This can appropriately fit under the dark green line that mentions “climate change” and “activism” among other things. Social entrepreneurship or triple bottom-line enterprises has been gaining momentum in recent years. More and more organisations are embracing dual or triple bottom-lines that maximize on social, environmental and economic goals. Another trend map for you – but this time one that works the other way around! As always it’s open source so people are encouraged to add to it, delete from it or otherwise play around with it (and if anyone wants the artwork file just get in touch). BTW, as usual it’s a bit of fun so it shouldn’t be taken too seriously. Vic: You make money for two reasons; to pay your bills and to do things you love. dreams and fantasies as to make life the most exciting of all time.